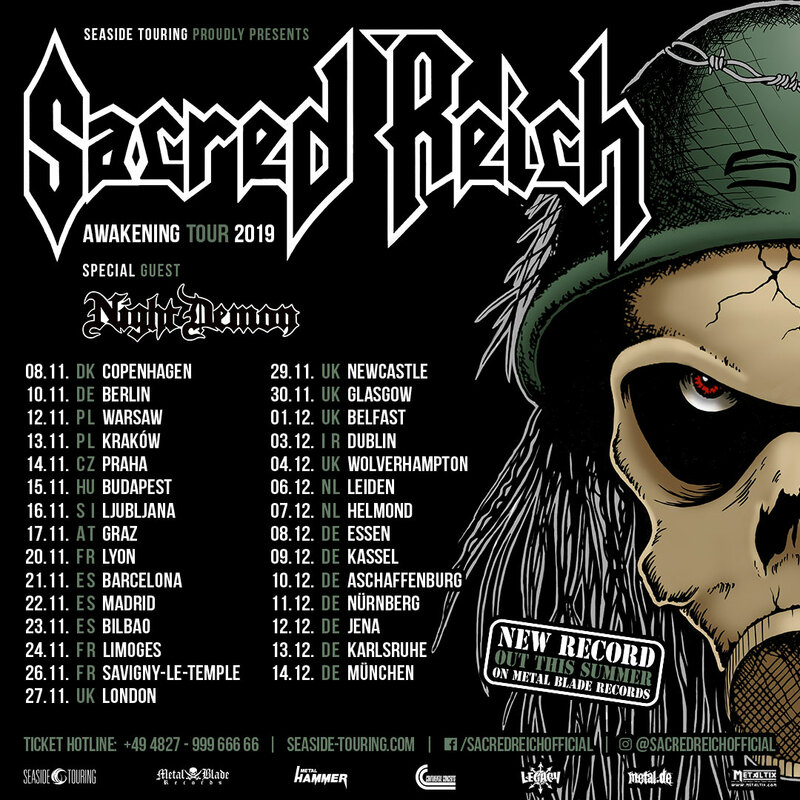 I remember the first time I saw Sacred Reich, at The Marquee in London in 1989. The first thing that struck me was that the queue was around the block. I guess I wasn’t alone in my admiration for the band. Once inside the excitement was palpable, there was an airof anticipation.. As the band slammed into the opening song the room exploded. Bodies were flying over the top of the barricade. An enormous pit broke out. People were jumping up and down and singing along at the top of their lungs. This was something to behold. Sacred Reich whipped everyone inthe sold out room into a frenzy and never let up. They pounded us with “Ignorance”, “One Nation”, and a blistering cover of Sabbath’s “War Pigs”.As the final strains of the encore “Surf Nicaragua” rang in my ears Sacred Reich triumphantly left the stage and left us to pick up the pieces. We were all blown away. Fast forward six months to the Dynamo Open Air in Eindhoven Holland. Sacred Reich has really hit their stride. From the momentthey hit the stage and dive into “Surf Nicaragua” the crowd is with them.Just as the Marquee show six months earlier bodies fly over the top, an enormous pit erupts in the middle of the crowd, and it seems everyone knows all of the words to every song. This time the crowd is 25,000 strong! Sacred Reich would go on to tour the world with Pantera, Sepultura, andDanzig to name a few, and release more great records but I will never forget “Surf Nicaragua” and those six months in 1989. You really felt like you were part of something. The big four Metallica, Slayer, Megadeth, and Anthrax had become big stars, leading the way, yet somewhat removed from the grass roots of the scene they put on the map. Sacred Reich still felt like “our” band. The mix of the pounding drums of Greg Hall, the powerchord acrobatics of rhythm guitarist Jason Rainey, Wiley Arnett’s incredibly tasty solos, and the unique vocals and provocative lyrics of bassist/singer Phil Rind was something real, something we could relate to. I followed the band throughout their career from “Ignorance” a blast of sheer force and in your face thrash, “Surf Nicaragua” possibly the greatest Metal EP ever, “The American Way” a musical and lyrical tour de force, “Independent” with new drummer Dave McClain (Machine Head) and a honed and polished sound and their last studio album “Heal” still heavy enough to kill your neighbors lawn. Put on those records today and they stand the test oftime, musically and lyrically. I guess the more things change the more they stay the same. It’s been twenty years since Sacred Reich released their debut record Ignorance (yes they were actually records on vinyl)\; andeighteen years since those memorable shows in London and Eindhoven. My hair has become a little bit thinner while my body has gone the opposite direction. Very recently I have received a bit of good news. In the summer of2007 Metal Blade Records will be re-issuing Ignorance and Surf Nicaragua together on two discs with some unreleased tracks and a DVD including footage of that famous Dynamo gig in 1989. And to add to my excitement the original lineup will be getting back together to do some shows in Europe. They will be playing some of my old stomping grounds London, Eindhoven, Belgium, and an appearance at Wacken Open Air! Thank you lads for getting back at it. I’m getting ready for people flying over the top, huge pits,and everyone singing at the top of their lungs! That’s how I remember it.I’ll be sure to get out the old neck brace!